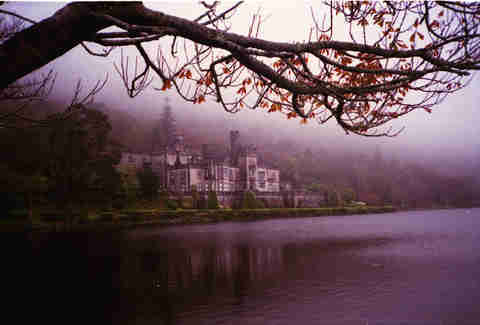 You already think Ireland is beautiful. 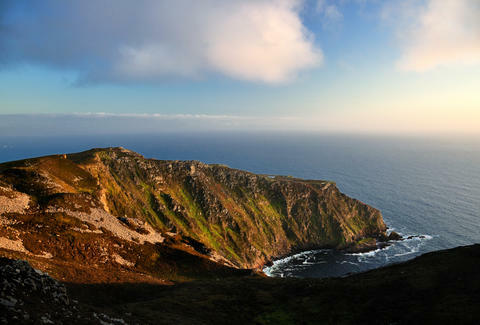 You've seen all that green in films, but there's more to Ireland than the cliffs from The Princess Bride. Check out this list and see what other spots make this country a sight for your eyes. Want to see a shipwreck without the vacation- and life-ruining possibility of getting the bends? Head over to the straight-out-of-a-picture-book village of Bunbeg for views of the early-‘70s Friend of the Sea shipwreck at Magheraclogher Beach. 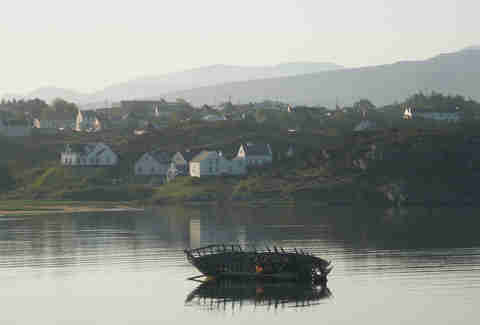 You’ll also snag killer views of Mount Errigal in the background. Yes, another foggy mountain. 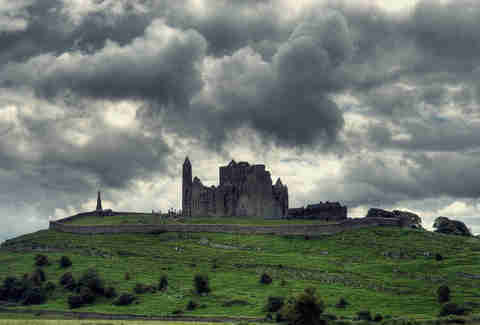 Because Ireland. 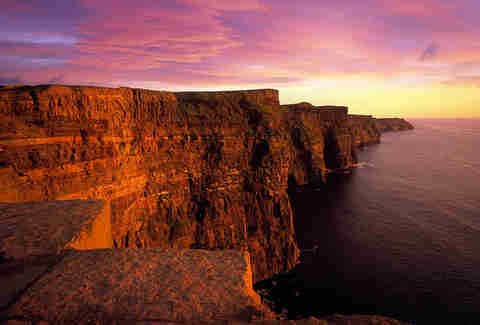 These cliffs are movie-star famous. For one, they’ve been featured in The Princess Bride, Harry Potter and the Half-Blood Prince and the surfing documentary Waveriders. At their highest peak, they tower more than 700 feet above the Atlantic. The spectacular view attracts 1 million visitors a year, and would almost certainly distract you in a sword fight with Inigo Montoya. These public swimming baths date back to the 1790s and were, until recently, derelict. Sort of fortunately, they were painted with a thin coat of pastel a few years ago, and now resemble a collision of ruins and the Easter Bunny. But don’t bring your Speedo—they’re still pretty gritty. That’s not to say they’re not beautiful. They’re just beautiful in the same way that floating plastic bag is beautiful in American Beauty, in that their charm is probably best accessed with an open mind—or an open mouth, facing a whiskey. 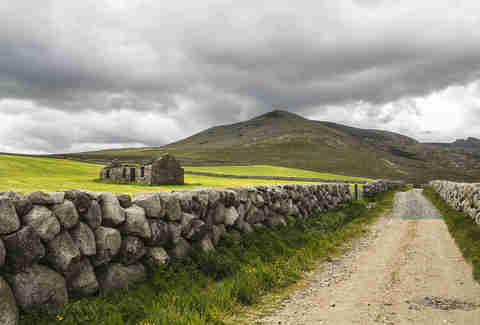 At almost 2,800 feet, the Mournes comprise the tallest peaks in Northern Ireland. But if giant, coastal, Irish mountains aren’t enough (you discerning devil, you), then perhaps the 22-mile Mourne wall that crosses 15 of the range’s summits will peak (sic) your interest. 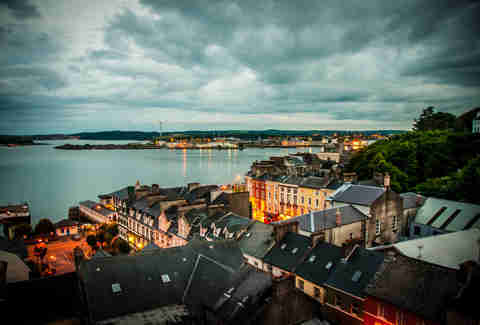 Along the sea on County Cork, you’ll find a super tiny Victorian township by the name of Cobh. Be sure to check out St. Colman’s Cathedral where you’ll find this ridiculous monstrosity. 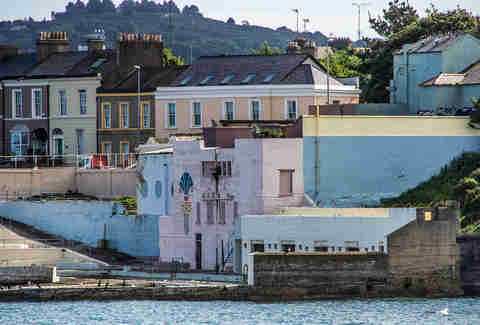 The town is also notable as the final port of call for the Titanic’s maiden voyage, though today it’s decidedly safer as you can hit up harbor boat sea angling trips that will totally deliver you safely back to dry land. Back in the day—50 million years ago, if you want to be a nerd about—there was some powerful volcanic activity, which spewed molten lava into the chalk beds here. When the lava dried, it formed neat rectangular pillars. That’s one crazy theory. 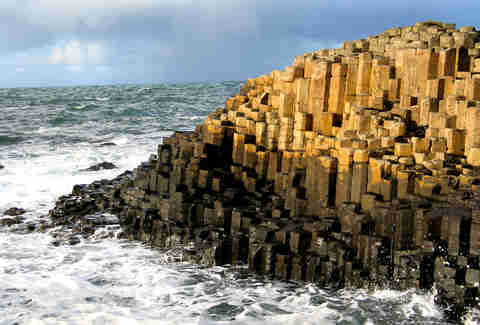 But if you’re into Irish mythology, the geological formations are leftovers from a path built by giants across the sea, hence the name Giant’s Causeway. You decide. It doesn't look like much, but in this age of cynicism, there's no more beautiful site than the continued existence of sweet, sweet gullibility. Frenching on this rock is said to endow some of its visitors with special powers. What kind of special powers? Being able to spit game. How can you be granted this gift of gab? You gotta kiss the Blarney Stone. Blarney means flattering, flirtatious talk. 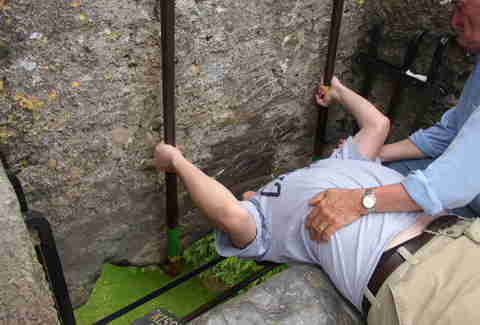 Kiss the Blarney stone, get Blarney. Sound easy? Well, after scaling the castle around it, you’ve got to lie on your back and, hang upside-down—as there’s a substantial parapet between you and the smoochable stone. If you only kiss one rock in your life, try and make sure it’s this one (and not Dwayne Johnson). 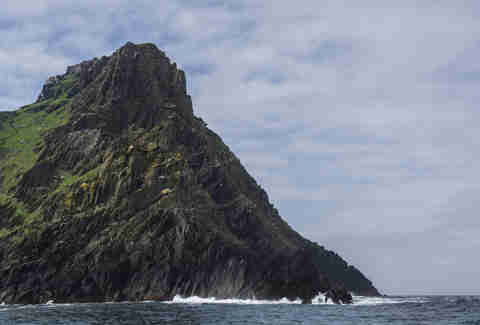 About seven-and-a-half miles off the coast of the mainland, Skellig Michael (and its tiny counterpart Little Skellig) is Ireland’s take on Santorini’s castle-studded isles. 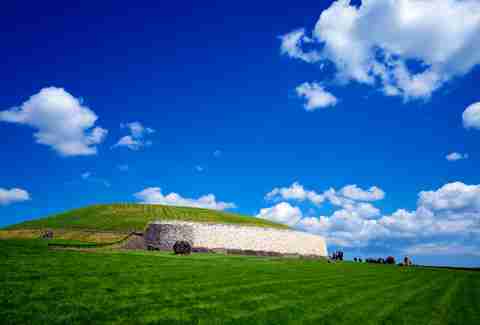 Aside from the fact that these are pretty much bite-sized versions of the green and stone of the Irish mainlands, you’ll also find the UNESCO World Heritage-certified remains of a 6th-century monastery (dudes). 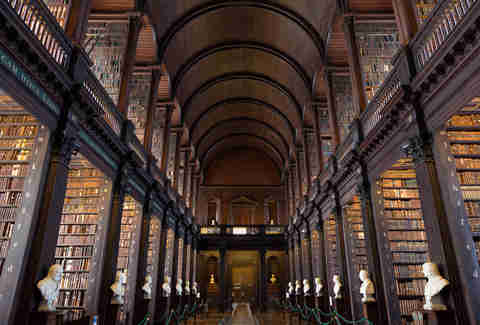 Think of this place as a one-stop shop for Irish history. This medieval castle and accompanying town offers prehistoric stone shelters, fortified monasteries, a Georgian cathedral, and that general sense of lordship usually reserved for your Game of Thrones mead and wine spread. 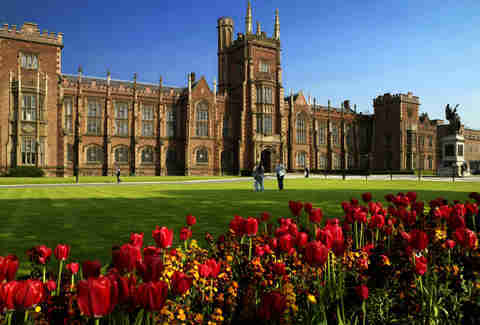 As a general rule, old colleges are pretty, and Queens University is no exception. Check out Grant Hall, easy to spot by its impressive limestone clock tower. And the student center has an on-campus bar, meaning you can register for classes, buy pens and get a pint all within a single building. Built around 3200 BCE, this prehistoric monument is older than both Stone Hedge and the Pyramids of Egypt. While its original purpose is not known, on the shortest day of the year (the Winter Solstice), one passage in particular fills with light, illuminating ornate stone spirals, leading some scholars to speculate that that the structure may have been used for a religious purpose, or one linked with astronomy. In short, it’s a building worth saving, so let’s keep hipsters out or they’ll move in and start pickling. On an isolated road, a thicket of gnarly beech trees line both sides; over time, the two rows have grown towards each other, becoming more and more entangled, and now exist in shape of an archway. 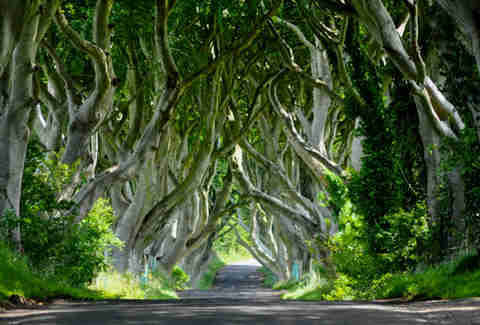 You might recognize these gnarly trees from Game of Thrones, but only if you’re heavily into the show and horticulture (*cough* supernerd). 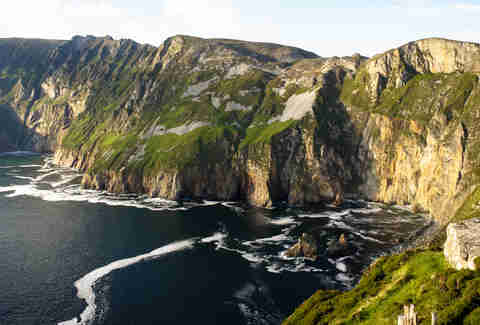 Sure, the Cliffs of Moher have that tourist-y notoriety, but heading to these Slieve League monsters on the Atlantic coast will grant you views that are three times higher (read: way freakin’ better), without a gaggle of other visitors asking where exactly Harry Potter stood -- for that un-stomach-able pole selfie they’re taking. 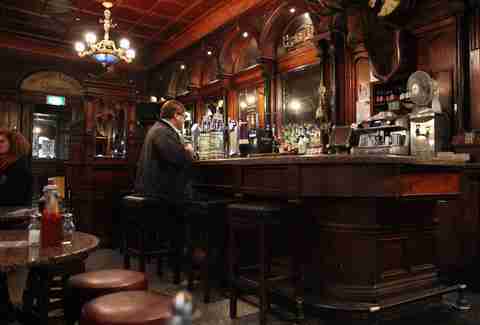 When you've climbed 100 cliffs and kissed some stones, there's no more beautiful sight than a pub. If there’s anything more quintessentially Irish than one hidden-down-an-alley, built in the 1780s and a cobblestone’s throw from Dublin’s Dame Street, we’re not sure what it is. This bar is straight up covered in rich mahogany and displays original whiskey mash barrels right alongside the pressed-leather booths you’ll sink into while downing a glass or two of the finished product.